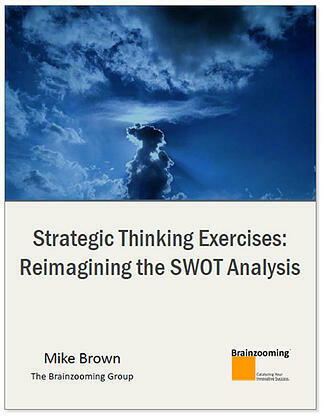 FREE Download: "Reimagining the SWOT Analysis"
One highly-effective way to turn a typical, boring strategic planning meeting into one that stimulates both minds and business is by introducing alternatives to traditional strategic thinking exercises. This will help your strategy meeting avoid hitting a strategic rut. Start your strategy planning changes by shaking up the traditional SWOT exercise that attempts to detail your organization's strengths, weaknesses, opportunities, and threats. This Brainzooming eBook reveals multiple approaches to generate fresh insights and turn the tired old SWOT into a fresh and imaginative strategic thinking activity.